We would like to thank each and every one of our partners for their enthusiasm and willingness to bring holiday cheer to their chosen organizations. Here is the final batch of our Christmas in the Community participants with their decorated trees and their recipients for 2015! The Peel Family Shelter helps provide “safe secure short term accommodation to families who are in a housing crisis,” and is Hilda’s chosen recipient for Christmas in the Community 2015. This is Hilda’s first time joining the campaign, and she let the people at PFS choose what tree they wanted for their space—our best-selling Ticonderoga Pencil Tree. She bought glittery shatterproof ornaments, and animal and character ornaments, and donated some of her own. She got the kids involved in decorating the tree and they had a blast doing it! See more of her decorated tree here! The perfect welcome for Santa Claus! Valerie of Occasionally Crafty was thrilled to give back to Devereux Arizona, a non-profit organization that provides therapeutic care, foster care, prevention, and treatment services for underserved children and adults. For this tree, Valerie used the classic red and white color theme to bring cheer to the Devereux center. She used peppermint-style ornaments, sparkly red and white baubles, Santa heads, and some Merry Christmas ornaments. She finished the display with a peppermint-print ribbon and a Santa hat tree topper. So cute! View close ups of her ornaments here! Cari used a classic theme for their new community center! Cari from Your Beauty Blog set up her donated Ticonderoga Pencil Tree in the reception area of her new local community center to bring some holiday cheer to everyone who entered. She wanted to keep things simple, so she went with the traditional red, green, and gold ornaments, a red ribbon, and a Santa-inspired bow as a tree topper. She also added candy canes for the kids to enjoy! Read more of their community center’s story in her post here! When Jen received an email from their local youth group calling for Christmas décor donations, she immediately knew which organization would be the recipient of her Christmas in the Community tree! She chose a North Pole theme for the tree to coincide with the youth group’s Christmas party. 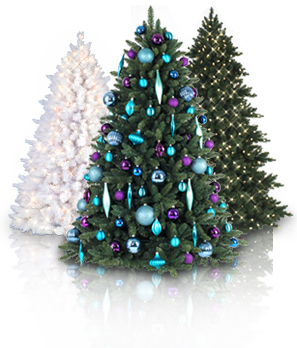 Festive and whimsical items such as peppermint patterns, a polka dot ribbon garland, candy canes, gingerbread men, and glittery baubles made the tree a display worthy of the North Pole. Jen also decorated the mantel with sparkly trees and a beautiful garland to complete the joyful atmosphere! Again, a huge THANK YOU to all our participants! We invite you to share the love and holiday spirit—join us for next year’s Christmas in the Community campaign!